King Ecbert died in 839. King Ecbert’s son, Æthelwulf, died in 858. Ivar the Boneless and the Great Army DID NOT LAND IN EAST ANGLIA UNTIL 865, when Æthelwulf had already been dead for 8 years. That army rattled around in Mercia for 10 years, and they didn’t settle in Repton until 871. It was Æthelred I who was King of Wessex in 871. He and his younger brother, Alfred, were the war leaders who faced the Great Heathen Army led by Ivar. It was not Ecbert or Æthelwulf. Do you see the problem here for crazies like me who try to recognize historical touchstones in this story? THERE AREN’T ANY!!! Okay, now that I’ve vented a bit, let’s look at what’s going on with the Lothbroks in this historical fantasy episode. First, there’s the Kattegat story line. Lagertha (Katherine Winnick) senses that trouble is on its way, and she’s preparing for it. 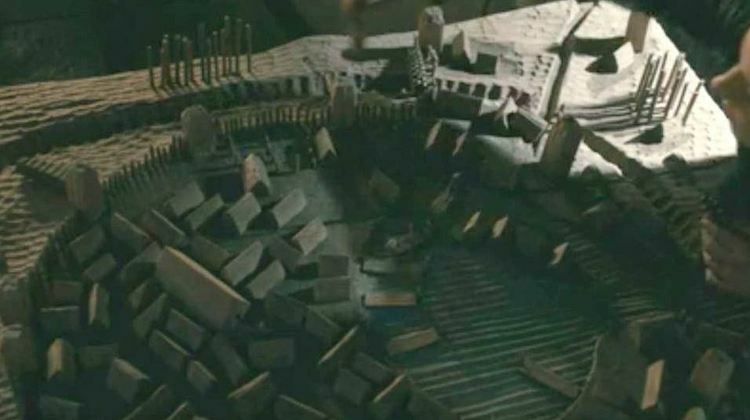 I love that sweet little model of Kattegat she is studying in her quarters. It’s doubtful that any such thing existed in Scandinavia in the 9th century, but it looks amazing and I want one. Not only that, she has discovered a Flammable Magic Powder which she has strewn on the ground so that when the bad guys head for her great hall, she just tosses a burning torch on to the Flammable Magic Powder and…whoosh! But hey! China had gunpowder, and – remember the slave girl Yidu earlier this season? She might have been from China, so maybe our Viking friends learned the secret of gunpowder from her. Somehow. Sure they did. Also, sorry Torvi (Georgia Hirst) but even if you had a crossbow in the 9th century, (probably not), it would not be humanly possible for you to reload as quickly as you did in this episode. And are you still alive? Inquiring minds want to know. 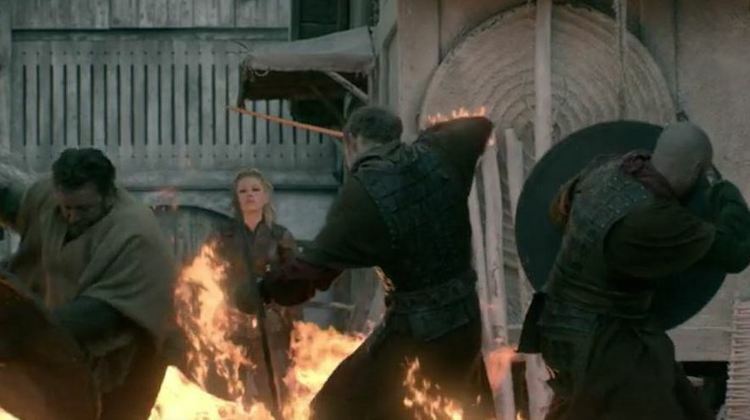 Lagertha learns that King Harald is behind the attack, so there will likely be some payback next season. Over in Wessex, it’s family time. Ecbert (Linus Roache) urges his mistress/daughter-in-law to return to her husband – the man he seduced her away from just ages ago – because Æthelwulf is going to need the strength and brilliance of her mind. This is a bizarre personality about-face on Ecbert’s part. While we are still reeling from that, we are treated to Æthelwulf (Moe Dunford) gently telling young Alfred, at bedtime, that his real father – the monk Athelstan – was a holy and special man. Wait. Is this the same Æthelwulf who hated Athelstan at first sight and railed against him for two full seasons of the show? Is this the same mean Æthelwulf who tossed poor Maxim (his mistress’s son) out of Winchester, alone and helpless? I’m watching this and wondering if Michael Hirst is trying to turn mean old Æthelwulf into a nice guy, into someone we want to root for. After all, historian Frank Stenton describes him as “a religious and unambitious man for whom engagement in war and politics was an unwelcome consequence of rank.” And who, in fact, led an army in 851 that was drawn from all over Wessex against a Viking horde made up of 350 ships’ companies, and won a decisive victory. He may have been overshadowed by his father, King Ecbert, but Æthelwulf was a pretty impressive king. So I’m thinking that maybe Hirst is giving him some credit at last. But then the Vikings arrive and, as in the first season, the poor Anglo-Saxons – even though they have cavalry, better weapons and better armor – are taunted and outsmarted by their clever Viking foe while Æthelwulf looks like an idiot and plays right into their hands. I hate it when the Anglo-Saxons are made to look like dopes. As for the smaller stories, while nasty Harald (Peter Franzen) is getting his Finehair braided he spots the woman he loves in the Viking camp with her husband. True to his despicable nature, Harald strolls over and tells her that he forgives her for making the mistake of marrying someone else, and then casually kills her husband with his trusty axe. Later, she honeys up to Harald and he is vain enough to believe her sweet words. I don’t believe her. And because I know that Harald goes on to become king of all Norway, I’m thinking this is not going to end well and, ow, I’m right. Also in the camp, Helga (Maude Hirst) panics when her adopted daughter, the foreign born Tanaruz, (Sinead Gormally) runs away. Floki (Gustaf Skarsgård) finds the girl and shows a not completely uncharacteristic tender side when he reassures the girl, but when he hands her back to Helga poor Tanaruz looks terrified, as well she should be. Helga’s mother-love is stifling, paranoid and scary. The Lothbrok boys are in camp and still sneering at each other – mostly Ivar (Alex Høgh Andersen), sneering at Big Bjorn (Alexander Ludwig). But Ivar convinces his brother to try a different battle plan than what the Anglo-Saxons expect, which leads to Æthelwulf’s frustration and humiliation, not to mention a lot of winded but gleeful Viking warrriors. 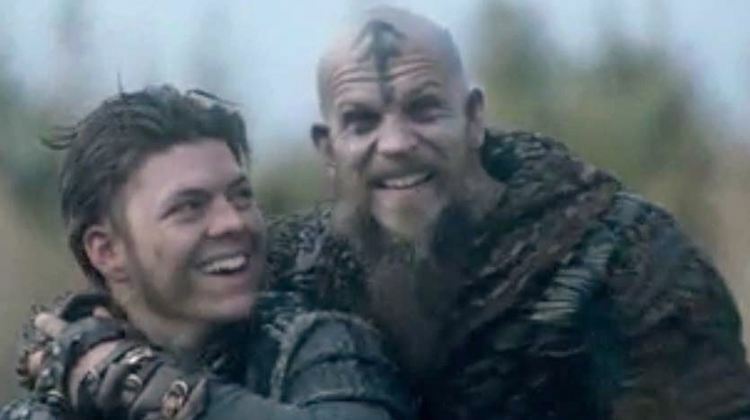 Well, Ivar’s not winded. He’s in a chariot. But there’s more battle about to come. 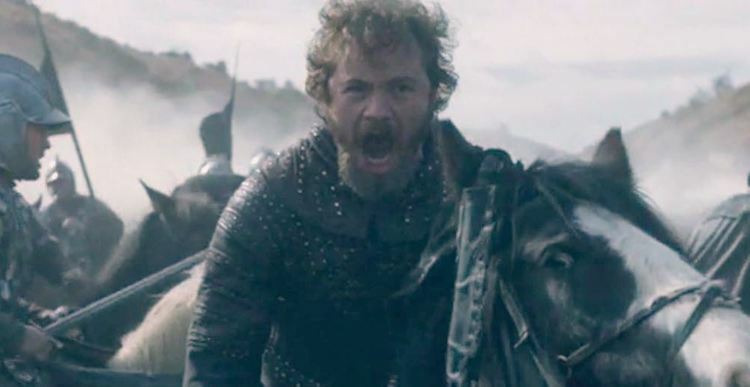 When the episode ends the Saxon army, shattered and in disarray, is charging toward a solid Viking shield wall. We have to wait until next week to discover who wins, but I’m putting my money on that shield wall. Hirst, though, has promised to toss in a new character next week – a West Saxon bishop who is much easier on the eye than the one we’ve been seeing in Winchester (no offence, bishop). 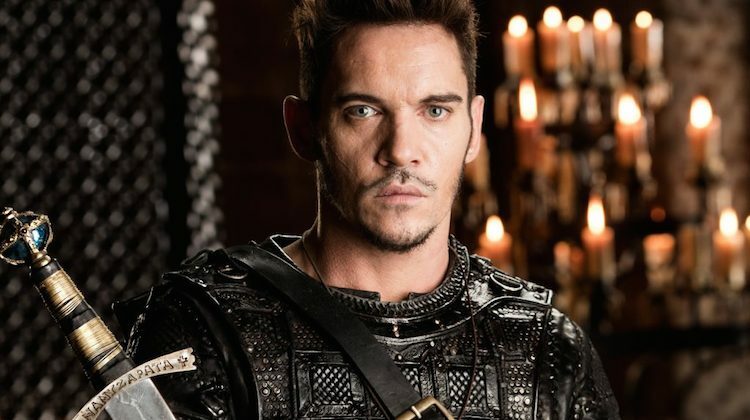 Jonathan Rhys Meyers steps into the role of the warrior bishop Heahmund, a historical figure who I’ve never heard of before today but who, according to Michael Hirst, will be a worthy opponent to Ivar. Meantime I have a very bad feeling that we might lose King Ecbert next week. The episode’s title: The Reckoning.